Every studio has them: giant posters (usually of upcoming movies) prominently displayed next to the front gates that serve to stroke the egos of powerful producers, directors or stars. It’s a big deal to get one, particularly at a studio like Warner Brothers, which churns out dozens of films and television shows every year. So Warner understandably stirred up discussion a couple months ago when it took down the giant vanity billboard dedicated to its animation department and DC Comics. The sign, a three-dimensional version of Mount Rushmore with Bugs Bunny and pals as the presidents, had been in place for 15 years on the north side of Stage 3. Workers began erecting a new one (behind a scrim) around the time that the studio laid off several hundred people, prompting some more talk: If Warner needs to cut costs by laying off the rank and file, why is it spending money re-doing a billboard? 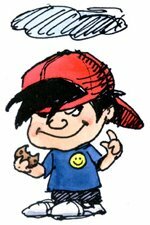 The answer came last night. The studio unveiled a new billboard – officially a “mural” – that primarily showcases super heroes from DC Comics against the Hall of Justice from the series “Super Friends.” Batman (go figure) looms largest, with Wonder Woman and the Green Lantern (both getting feature films in coming years) also appearing. Making cameos: Scooby Doo, Tweety Bird, Bugs Bunny and Daffy Duck. At night, black lights reveal villains like Catwoman and Two-Face in the background. 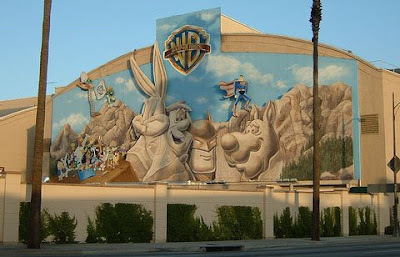 The mural – Warner’s not saying how much it cost – was planned back when the studio was still hot on making a tentpole movie featuring multiple heroes called “Justice League.” A Warner statement said it was time for an update after 15 years, particularly as the studio’s animation strategy has shifted (repeatedly) over that time.